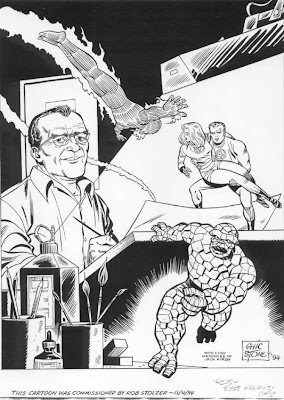 Stone is probably best known for inking a number of Marvel comics in the 1960s, but he was an old hat by that point, having first worked in the Eisner-Iger Studios beginning in 1939. He wound up doing work for Fawcett, Lev Gleason, Timely and DC, sometimes ghosting for Bob Kane on Batman. He also went on to work for Dell and Skywald before a long stint with Archie Comics. The piece above was obviously in deference to his inking work on over Jack Kirby's Fantastic Four, though this particular piece features his pencils. You can see that it's dated 1994, when Stone would have been 71. He died in July 2000. That's great. What a wonderful piece.